What are the dimensions of the tips? Lately many have asked about the Durometer testing and results. I find the testing inconclusive as part of my occupation involved doing such testing. The tests are done 12 mm from the edge of object tested. A 14 mm cue tip has no distance of 12 mm from any given edge. Test results would also need to indicate if the test was performed before or after the application to ferrule and the crowning effect given after cutting through the leather. The demand is great for this knowledge so we offer it only as a guideline. The numbers will also fluctuate if one wants to wet the layered cue tip and press it over night before application. 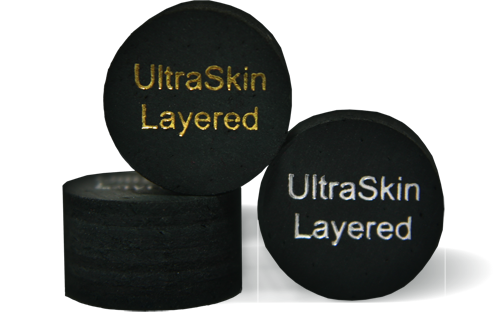 UltraSkin Layered Cue Tips strongly advises your layered cue tips be applied by a professional whom after talking to you would set the correct tip to perform for your desired game. Most players with full custom cues have two shafts. We strongly recommend a different hardness setting for both to allow for the same reaction on different table conditions, i.e. nap of cloth, humidity etc. Why UltraSkinLayered Layered Cue Tips? Soft:This Layered Cue Tip is great for players in games where a tremendous amount of spin is desired. Hard:This layered Cue Tip is for the player that wants to feel the Cue Ball but prefers 90% of the hit and movement to be achieved through just the natural stroke the player has achieved through years of practice. Do Layered Cue Tips Require Chalking? Yes, without question. I have read about many Layered Cue Tips that make claims that you can chalk a cue once and go many racks without mis cueing. I have no proof on how many shots you can attempt with Layered Cue Tips before you mis cue but can promise YOU WILL MIS CUE. When you mis cue you will leave the table and give it up to an opponent. The opponent can not beat you if you have the table so with this logic you stand a chance of letting yourself be beat by any belief you do not need to chalk a layered cue tip while playing. Now for the funniest thing you will ever read about not having to chalk a layered cue tip. Some of the ones that tell you that chalk or hardly ever having to chalk want you to buy the mystical chalk they make for $20.00 - $30.00 a cube This contradicts every claim they make. You have gone from never or hardly ever chalking a layered tip to spending upwards of $30.00 for a piece of chalk when every Pool Room or Bar Table supplies you with chalk FREE. What is the purpose of chalk? To help prevent you from mis cueing. IMO chalking serves another purpose than to prevent the mis cue. It slows you down a little giving you more time to think about the next shot. Using layered cue tips that you believe you do not need to chalk gives you nothing to do but proceed immediately with the shot you had planned next so you hurry back on the table. Your position however might have been a few degrees off making the way you had pre planned a few degrees off. Chalking your layered cue tips gives you time to think and observe before approaching the table again. In chalking your layered cue tips you have greatly increased your chances not to mis cue and have been able to rethink if you need to adjust the track of play to prevent those few degrees you were off back into perfect position which increases your chances of winning. You however are your own person. If your going to pay $45.00 up to have layered cue tips installed because you will not need to chalk as often, and spend the $30.00 a cube for the mystical chalk they said you were not going to need you should also buy the scuffer they sell that you were told you didn't need for the layered cue tips they sell.